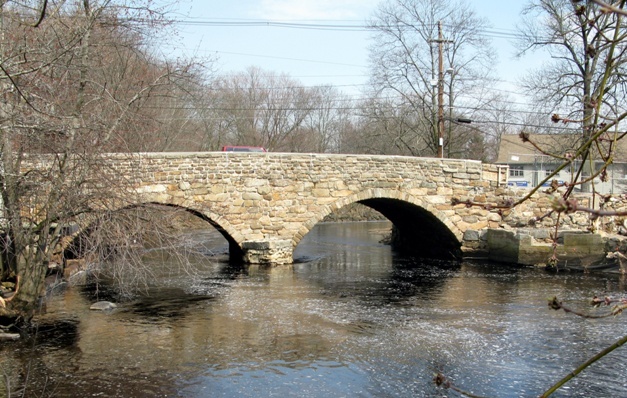 The American Society of Civil Engineers cites the Choate Bridge in Ipswich as the oldest documented two-span masonry arch bridge, and the oldest extant bridge in Massachusetts. 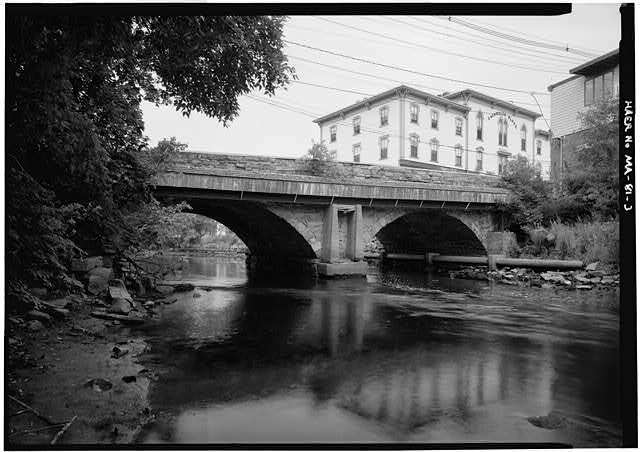 The Choate Bridge was added to the National Register of Historic Places in 1972. 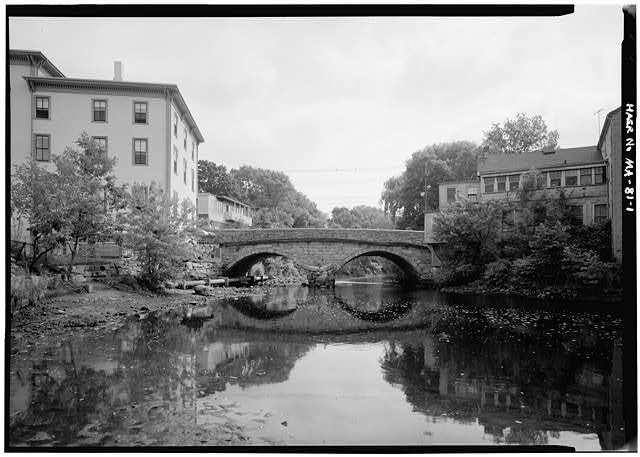 The Choate Bridge was constructed in 1764 and is the oldest documented surviving double stone arch bridge in North America. As part of Rt. 1A and Rt. 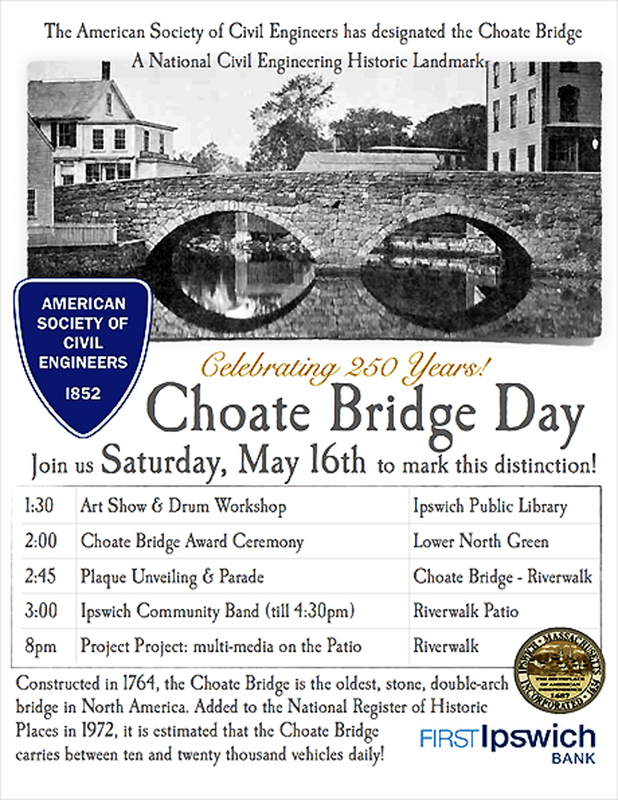 133 the Choate Bridge is estimated to carry between 10,000 and 20,000 vehicles each day! 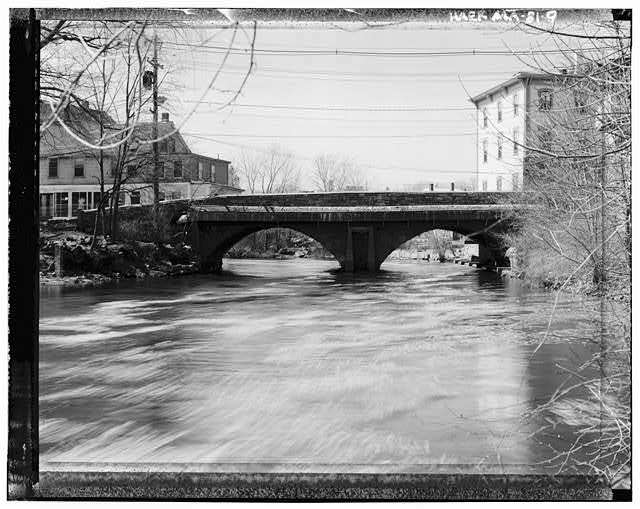 The town approved construction of the stone bridge on April 18, 1764. 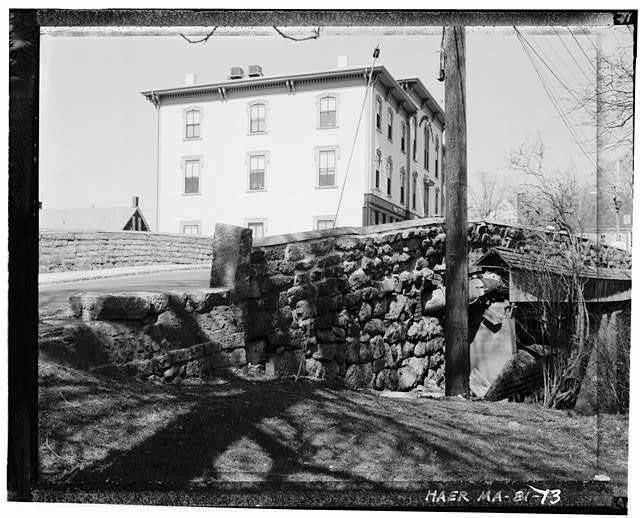 The town voted on September 10, 1764 to add 3′ high stone wall guards, which can be clearly seen in the photographs. 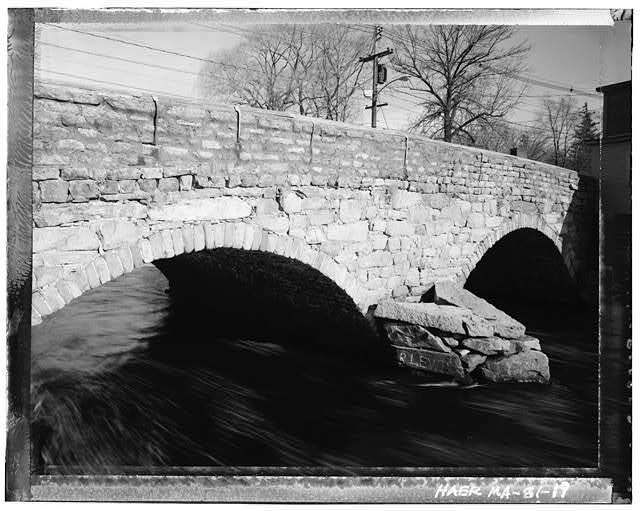 In 1645 a wooden cart bridge was built where the river curves around the massive granite underlying Town Hill. 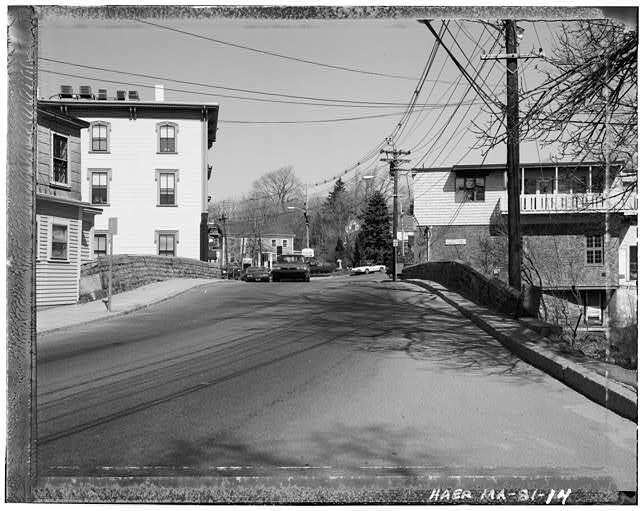 This made possible the extension of Main Street to the South Green, and there has been a bridge at this location ever since. 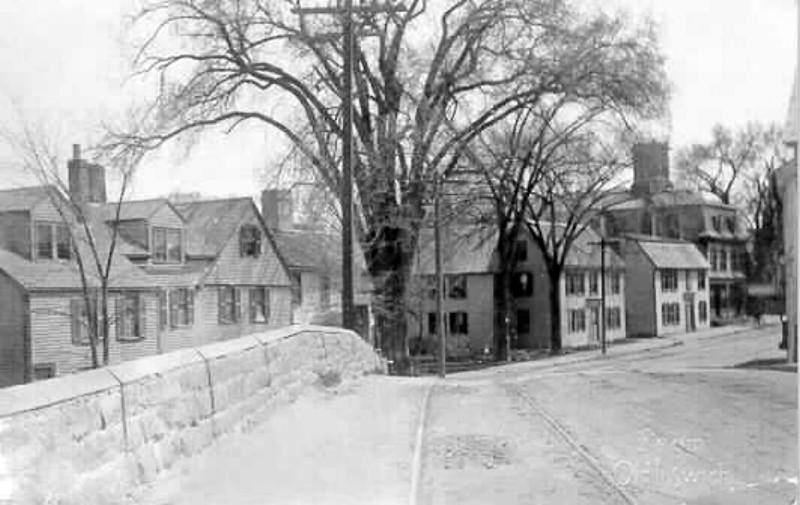 By 1764 the cart bridge was far too narrow for the steady traffic across the river, and a new one twenty feet wide was planned by the town. The total cost of its construction was £996. 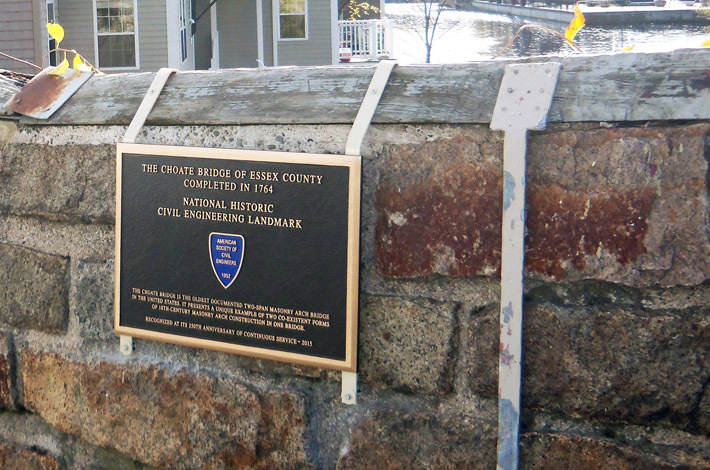 Col. John Choate, who designed and oversaw the construction of the bridge, refused compensation. 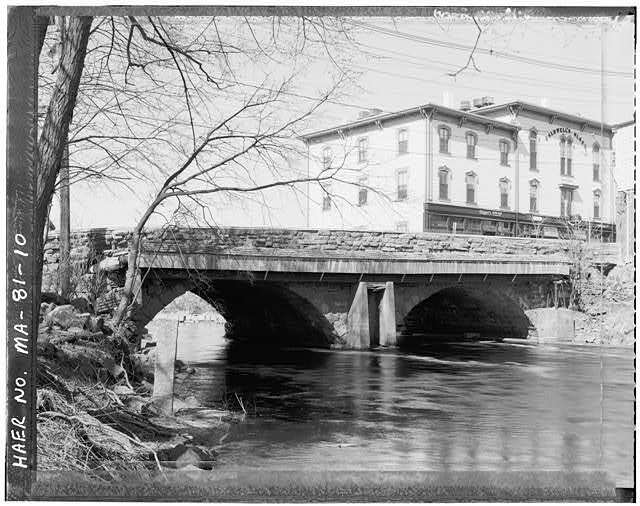 The original portion of the bridge, built in 1764, is the westerly (upstream) half. 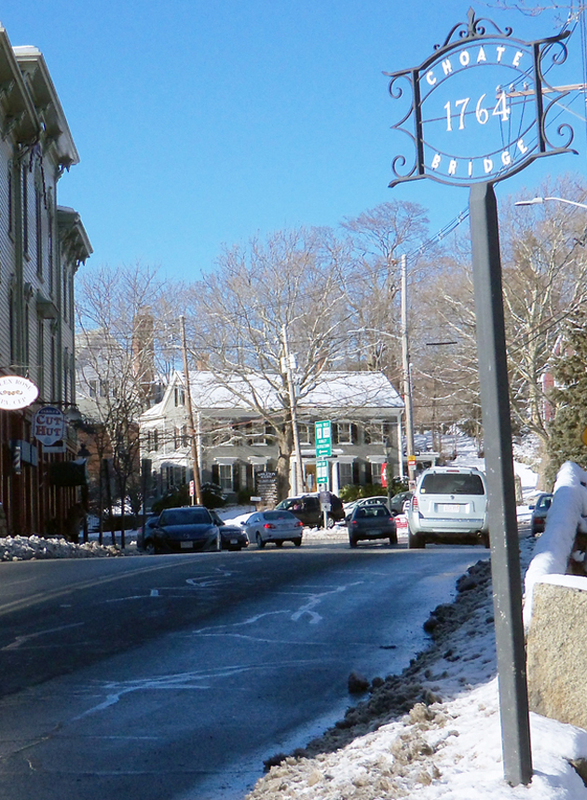 The arch ring stones of this original section are the smaller, roughly squared stones, originally set in a lime/sand mortar, much of which remained between the arch ring stones as late as 1988, when the mortar was analyzed by William Finch of Preservation Technology Associates, Inc. for the Town of Ipswich. This mortar was found as deep as 12” into the beds of the arch ring stones, and as much as 6” deep in joints as narrow as ¼”, leading Mr. Finch to presume that this rather coarse mortar could only have been placed there during the original construction. 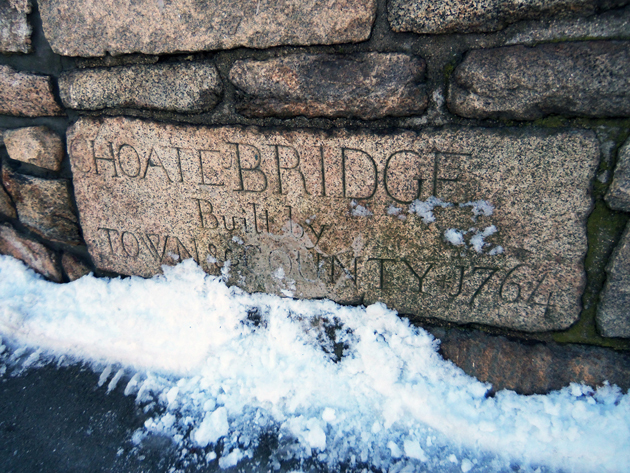 While the specific source of the stone used for the original arch rings has not been discovered, the presumption would be that the Choate’s builders located a nearby ledge or outcropping, or a field of boulders of a suitable stone, and then split and dressed the blocks with hand tools to their roughly squared final form. 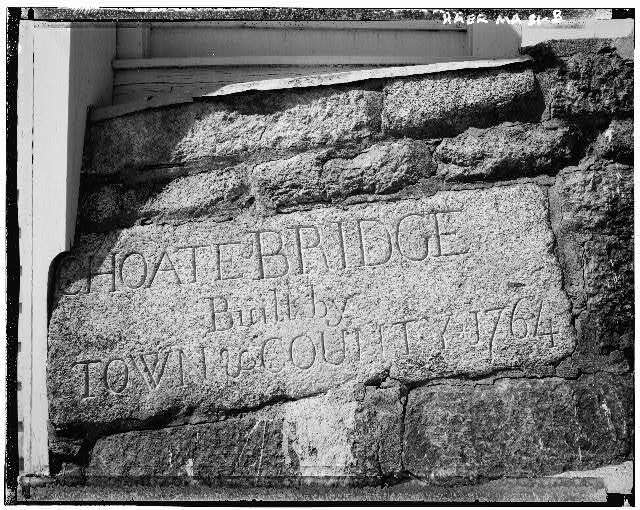 Farmers of that time could have used the same techniques, if they were willing to expend the time and energy to dress the stones, but most farmers were satisfied to use field stones and roughly split surface rubble (similar to the stonework of the Choate’s spandrel walls – the vertical outer walls over the arches) for their stone walls. 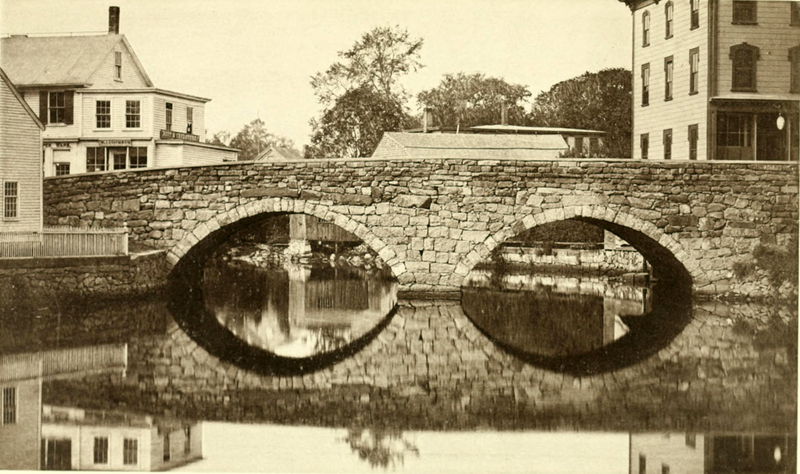 The added portion of the bridge, built in 1838 (the petitions, meetings, and paperwork started in 1834, but not the construction) is the easterly (downstream) half. 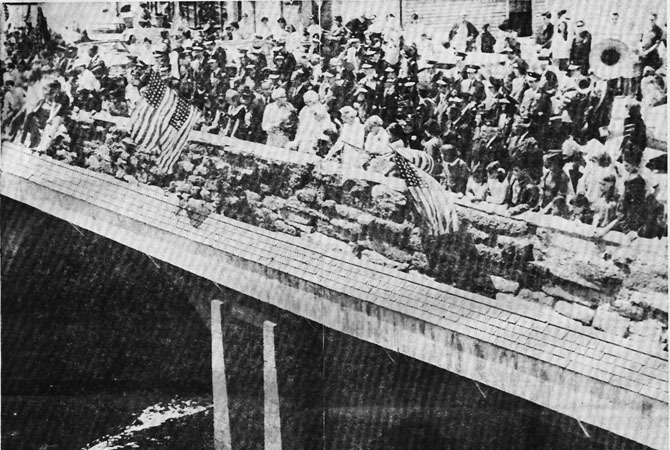 This portion of the bridge was constructed of much larger blocks of drilled-and-split stone, undoubtedly produced by a commercial sub-surface quarry operation. These 1838 arch rings were originally laid dry. 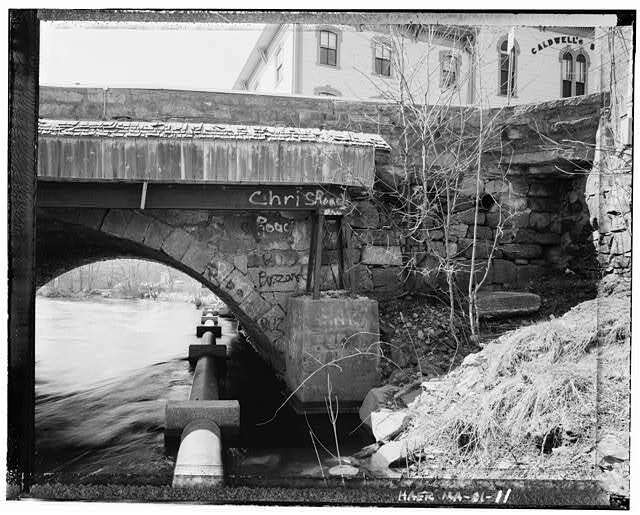 I have found no clear evidence as to whether the cutwater on the upstream nose of the Choate’s pier is part of the original 1764 construction. 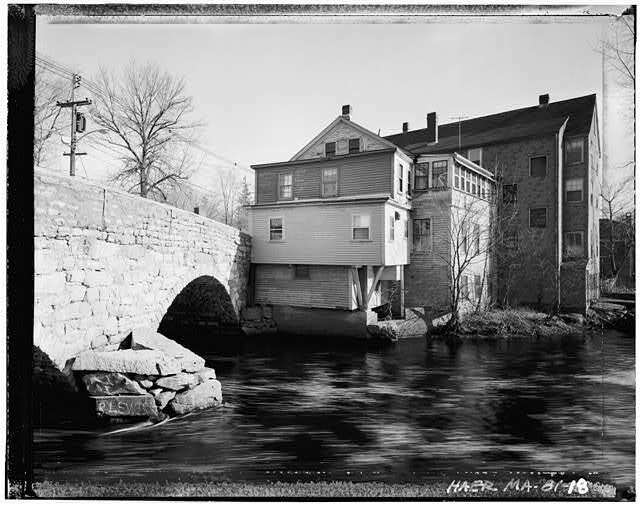 Cutwaters (to protect a pier from ice, logs, and raging currents) were certainly built in the eighteenth century, and the cutwater on the Choate appears in a ca. 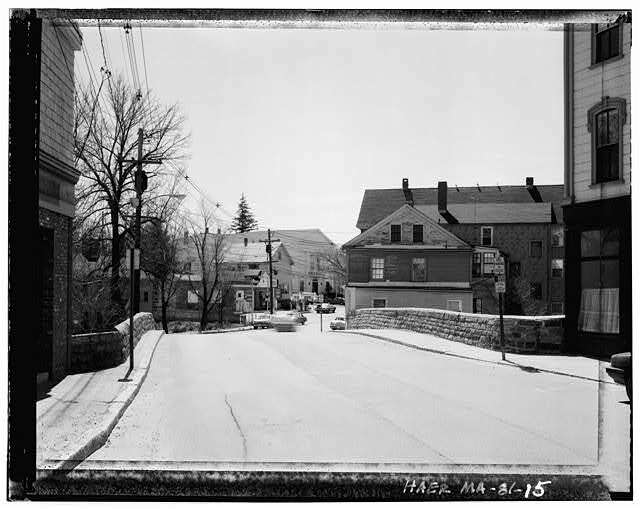 1910-20 photograph (at Historic New England, Inc.) so it’s definitely not a modern alteration. 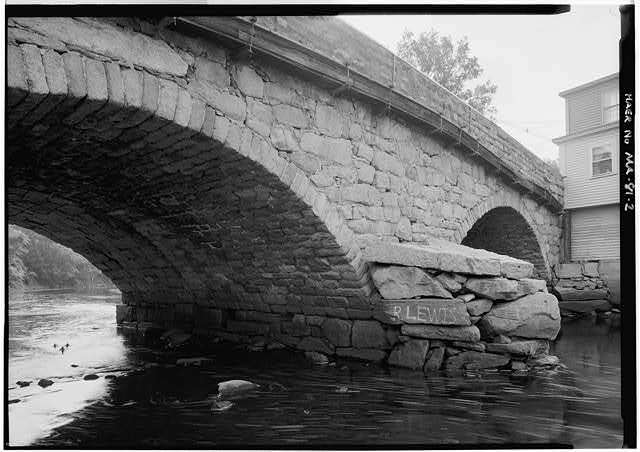 From documentary information in MassDOT’s Historic Bridge Inventory files, and personal inspection by S.J. Roper, MassDOT Historic Resources Supervisor. 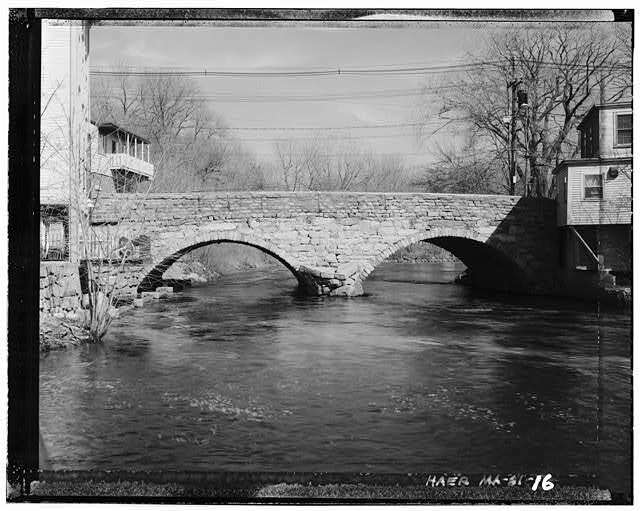 The Choate Bridge was listed in Massachusetts as an Archaeological/Historic Landmark on April 1, 1966. 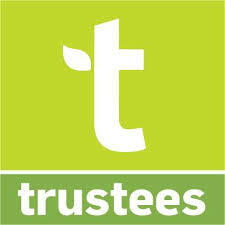 On the same date a preservation restriction was established with Mass Historic. 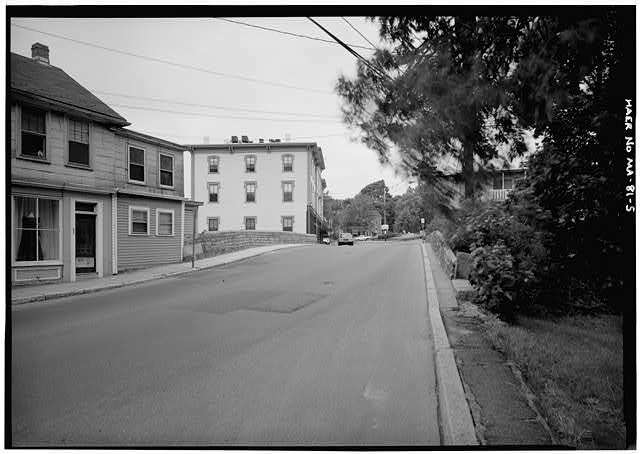 It was placed on the National Register of Historic Places in 1972. 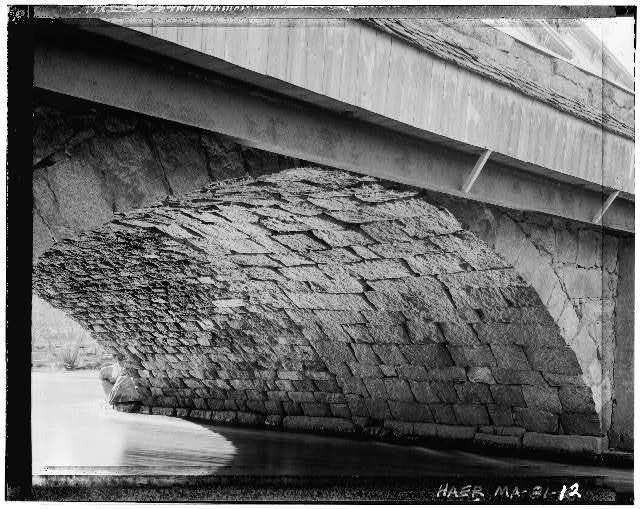 The following photos of the bridge were taken in 1934 by Arthur C. Haskell and are featured in the Historic American Buildings Survey (HABS) and Historic American Engineering Record (HAER) at the Library of Congress. The photos below are from the Historic American Buildings Survey (HABS) at the Library of Congress, taken in 1981 for the Historic American Engineering Record (HAER) established in 1969 by the National Park Service, the American Society of Civil Engineers and the Library of Congress to document historic sites and structures related to engineering and industry. 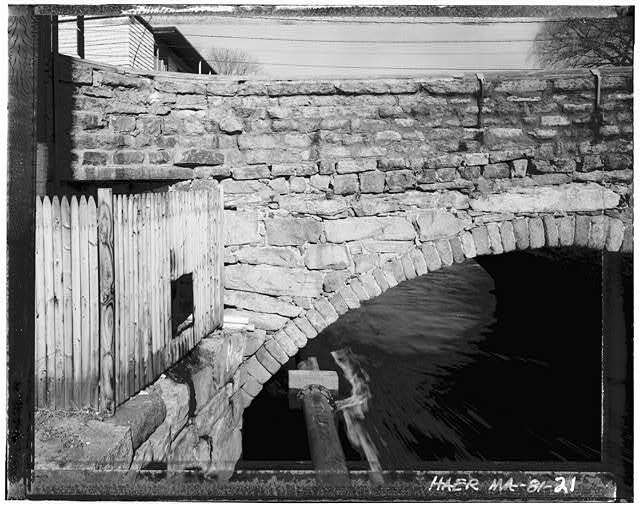 HAER works with (HABS) the program after which it was modeled, and documents how bridge components fit together, with measured and interpretive drawings, and a report that indicates the site’s significance. 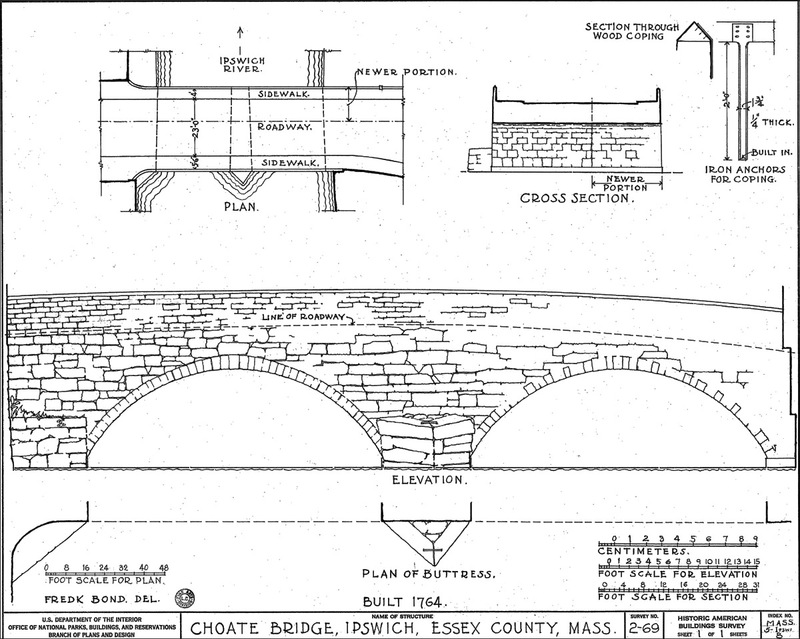 HAER field measurements for the Choate Bridge. 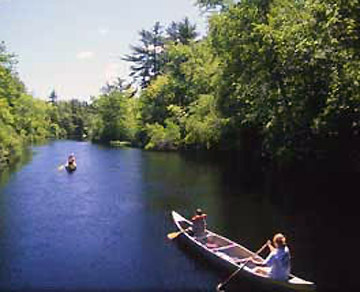 Field measurements were taken by Frederick H. Bond of Boxford.